What wine goes with cat? 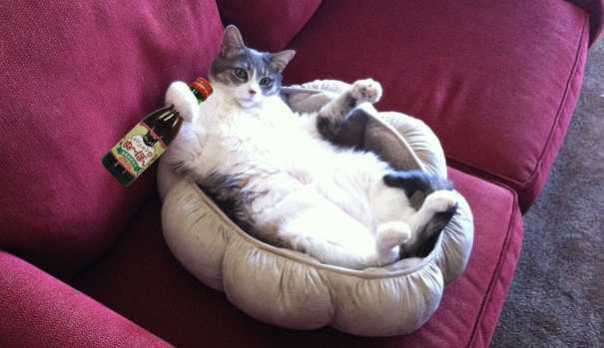 Nyan Nyan Nouveau, of course, the non-alcoholic tipple made just for your purring pet! Designed to appeal to the discriminating tastes of oenophile kittehs, Nyan Nyan Nouveau is made with the juice of Cabernet Sauvignon grapes and embodies hints of catnip in its feline-friendly aroma. Made by Japan's B&H Lifes, Nyan Nyan Nouveau's recent arrival on store shelves is perfectly timed to catch the buzz from the annual release of Beaujolais Nouveau. According to the manufacturer, Nyan Nyan Nouveau was created in response to requests from pet-owners who would love to toast special occasions like Christmas, New Years Eve and birthdays with their beloved furry friends. Those concerned with health issues can rest easy: Nyan Nyan Nouveau contains small amounts of Vitamin C and although the manufacturer doesn't tout the fact, may also provide traces of the anti-oxidant compound Resveratrol, reputed to have anti-aging properties – in humans, at least. As is the case with other pet-friendly drinks from B&H Lifes, Nyan Nyan Nouveau sports attractive packaging: brown-tinted glass bottles feature charming graphics highlighted by the head of a cute black cat. The black cat theme also graces the top surface of the red screw-on caps. With Teacup, Toy, Pocket, Micro, Mini, Nano & Juliana Pigs, Does Size Matter?